The first day of April marks the 40th anniversary of the founding of Apple - well the incorporating of Apple anyway. 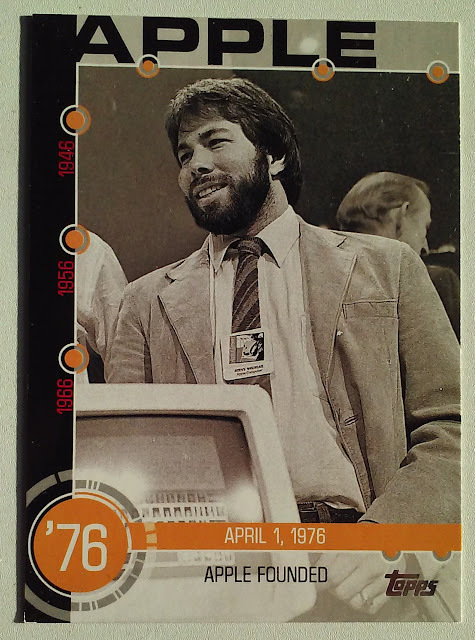 Interesting that Topps chose to have Steve Wozniak for the Apple photo rather than Steve Jobs. It appears that Jobs was actually cropped out of a larger photo. It should also be noted that the photo was from an event on April 24 1984 when a new generation Apple IIc was released. A third Apple exec John Scully stands between Wozniak and Jobs in the original photo. A power struggle between Scutlly and Jobs would lead to Jobs leaving Apple later in 1984. Regardless I am happy with Wozniak getting top billing here, partially because he is often seen as the sidekick and partially because he just seems like a cooler dude. Wozniak may be on the front of the card, but Topps leads off with Jobs on the back. 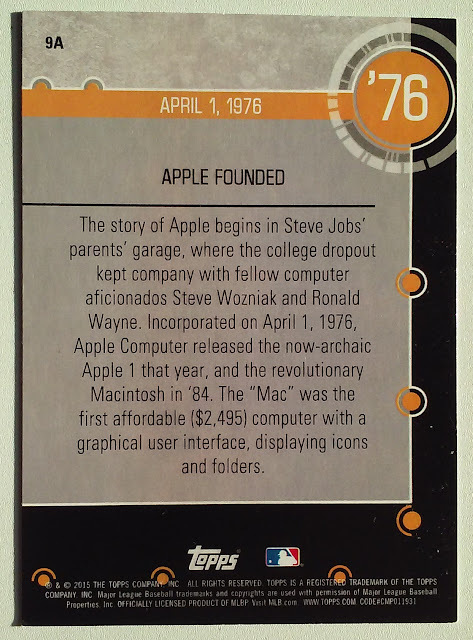 In addition to mentioning the 1976 incorporation of Apple Topps also notes the 1984 MacIntosh release, perhaps a nod to the photo on the front. In 1976 I am pretty sure nobody in Silicon Valley or the Bay Area noticed the founding of Apple. If they did they likely had their attention diverted a day later when Reggie Jackson was traded by the Oakland A's to the Baltimore Orioles. The trade is the subject of the Baseball History #9B card which is related to the Apple Card. It is one of the few cards to feature the Hall of Fame slugger as an Oriole. On Tuesday night we mentioned all the All-Stars that are part of 2016 Heritage, but have their cards relegated to the harder to find Hi Number series. With 31 of the 75 Hi#s dedicated to the ASG participants there remains 44 slots for other players. 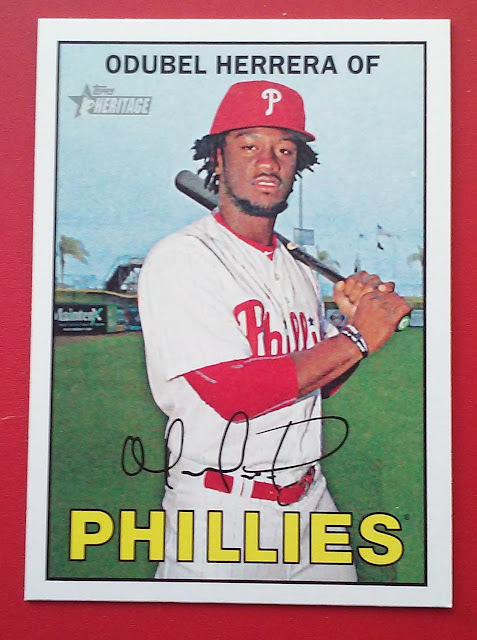 I fortunately did not have to look for this Hi# long, We pulled Odubel in our first pack of Heritage. Decent spring training shot, nice to see the palm trees in the background. The card and picture definitely evoke the feel of the original 1967 Topps. Odubel Herrera resides at card #498 in Heritage and bears no connection to the player on the original card, Larry Dierker. The above chart is a comparative of the original 1967 Topps with this years Heritage set. This will come in handy if I ever decide to fill out the team set. There are 18 cards on the team checker. Herrera is one of two Hi#s, the other is Maikel Franco at #473. I will take another turn at reprimanding Topps here. Out of the Phillies players awarded Heritage cards the top-3 in 2015 WAR were Herrera, Aaron Nola, and Franco. Two of the three have been banished to the High set. 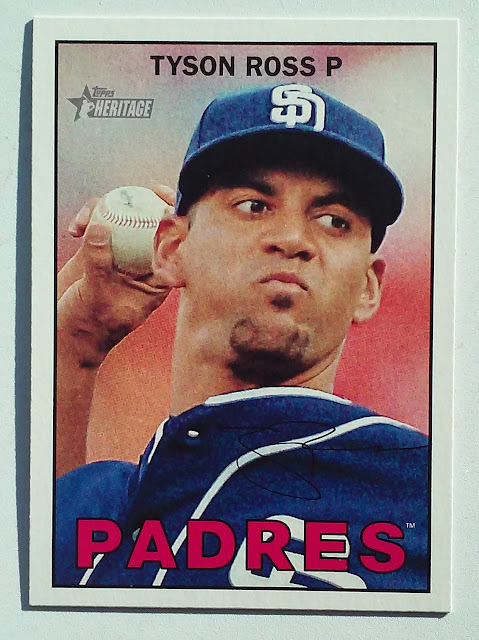 Yeah I will never find a reason to post a pix of this SP of Tyson Ross, but figured I would give it some life here, just in case we never see the card again. For what it's worth the #448 card was occupied by Harry "the Hat" Walker - a card that according to Cardboard Connection was DOUBLE-PRINTED. Does Topps Really Short Print all the SuperStars in Heritage? I am not here to debate the merits/issues of Short Printed cards, not tonight anyway. 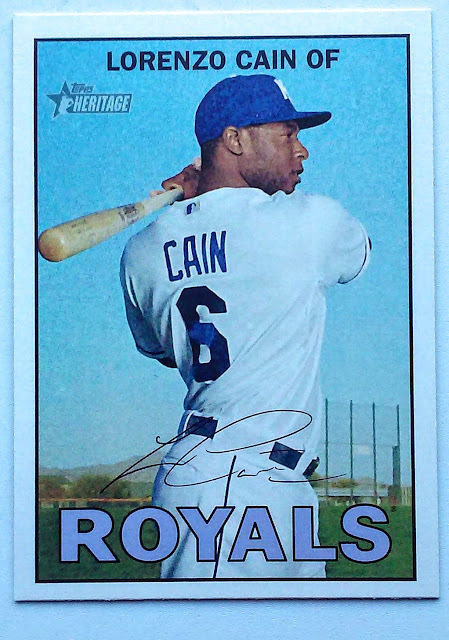 It has been mentioned that there are a disproportionately large number of stars among 2016T Heritage cards which run from #426-500 and can only be found at a rate of 1:3 packs. If your favorite player is Mike Trout and he is in the SP range, you may be upset at how hard his card is to find. That doesn’t necessarily mean that more stars are short printed. While there are many Stars in the high range there are plenty in the base set, Andrew McCutchen, Adam Jones, Jose Bautista and Kris Bryant among them. How do we go about figuring out if the Stars are backloaded into the Short Print Range? For purposes of our study we picked the 2015 All-Star teams. I admit the way the All-Star team is composed is a complicated process subject to the whims of a popularity contest. Regardless, every player that makes the squad is a star at some level, even if it is because of strong public persona or due to the mandatory rep for each team clause. How many Star Players should be Short Printed? To give Topps some extra room we rounded up. How many Stars are SP in 2016T Heritage? That is just a shy of 42% close to Three-Times the expected number. Among the first 425 cards 43 are Stars just a tad more often than 1 in 10. The final 75 cards include 31 Stars, that is more than 1 in 3. 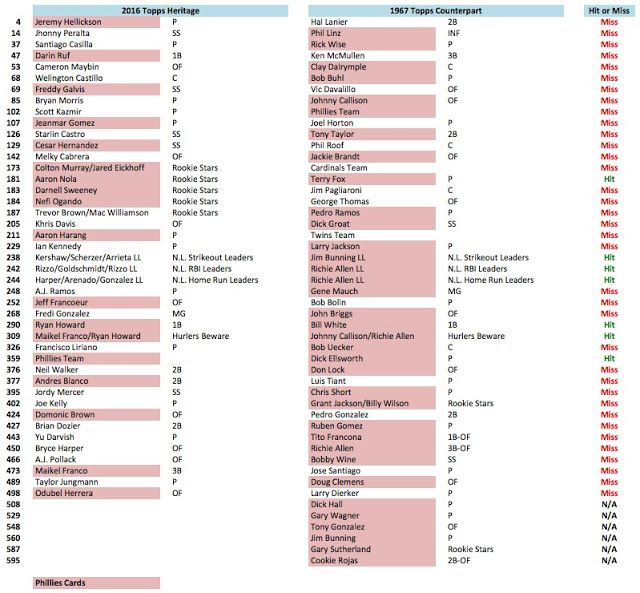 The Chart below lists all of the 2015 All-Stars in Topps Heritage Numerical Order. The red notes the High Numbers that start at card 426 - Clayton Kershaw.